A budget is a financial statement comprising estimates of government revenues and expenditures for an financial year (April to March). Usually Budget is presented by Financial minister on the last day of February. The day of presenting budget changes in an election year. In this case only a temporary budget comprises of expenditure for 3 to 4 months. This budget is called Vote on account budget. Let us have a look at the different terms in the header. 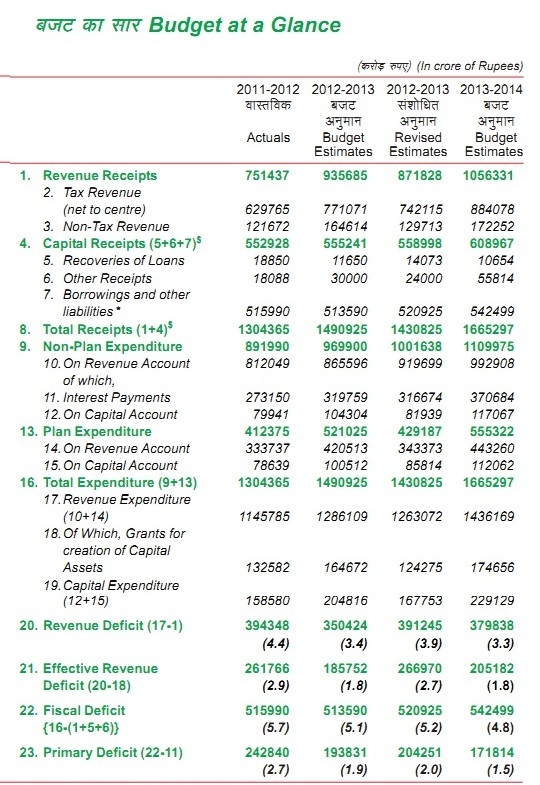 Actuals : This gives you actual figures of 2011 - 12 Budget. Budget estimates : This gives you 2012 - 13 Estimated Budget. Revised Estimates: Based on the actuals upto 10 months, estimated budget figures are revised. a. Taxation revenues: eg., receipts from corporate tax, income tax, excise tax, Excise duty, custom duty, service tax etc. b. Non tax revenue: which include interest on loans, dividends from Public sector units, Fees and stamp duties. 2. Capital receipts: Which refer to those inflows to government that are not in the nature of regular income, But are repayments / recoveries, or proceeds from sale of assets. Other receipts like Disinvestment (selling some shares of a PSU) comes under this head. Borrowings are simply the deficit which can be covered by taking loans from market. Non plan expenditure: These are on going expenditure not covered under the 5 - year plans. India has adopted economic planning as a strategy for economic develop­ment. For stepping up the rate of economic development five-year plans have been formulated. So far ten five-year plans have been completed. The expenditure incurred on the items relating to five year plans is termed as plan expenditure. Such expen­diture is incurred by the Central Government. A provision is made for such expenditure in the budget of the Central Government. Assistance given by the Central Government to the State Governments and Union Territories for plan purposes also forms part of the plan expenditure. Plan expenditure is sub­divided into Revenue Expenditure and Capital Expenditure.This expenditure involves funding for programmes and projects covered by the 5 - year plans as decided by the various ministerial bodies. a. Revenue expenditure - It is payments incurred for day - to - day running of government departments and various services offered to citizens. This also comprises of spending towards subsidies, interest payments. This spurs consumption in economy. b. Capital expenditure: This expenditure spurs asset creation, resulting in increased investment with spending diverted towards cost associated with acquisition of assets that may include investments in shares, infrastructure as well as loans and advances given out by government. Public debt: The money borrowed by the government is eventually a burden on the people of India, and is, therefore, called public debt. It is split into two heads: internal debt (money borrowed within the country) and external debt (funds borrowed from non-Indian sources). Fiscal deficit: The money borrowed by the government is eventually a burden on the people of India, and is, therefore, called public debt. It is split into two heads: internal debt (money borrowed within the country) and external debt (funds borrowed from non-Indian sources). Usually the government spends more than what it earns through various sources. This shortfall, which is met with borrowed funds, is called fiscal deficit. Technically, it is the excess of government expenditure over 'non-borrowed receipts' — revenue receipts plus loan repayments received by the govt plus miscellaneous capital receipts. Fiscal deficit for FY13 is estimated at INR.5.64 lakh crore, revenues of INR 9.18 lakh crores less expenditure of INR 14.82 lakh crores. Fiscal deficit is measured as a percentage of GDP, hence INR 5.64 lakh crore / GDP of INR 100.74 lakh crores work out to estimated fiscal deficit of 5.6% of GDP. Revenue Deficit: It is the excess of revenue expenditure over revenue receipts. All expenditure on revenue account should ideally be met from receipts on revenue account; the revenue deficit should be zero. In such a situation, the government borrowing will not be for consumption but for creation of assets. Effective revenue deficit: This is an even tighter number than the revenue deficit. It is revenue deficit less grants for creation of capital assets. Deficit and GDP: Apart from the numbers in rupees, the budget document also mentions deficit as a percentage of GDP. This is because in absolute terms, the fiscal deficit may be large, but if it is small compared to the size of the economy, then it's not such a bad thing, especially if it is being used to create production capacities.